Finance influences everything, from the growth of businesses and employment to capital and even public services. As the world becomes increasingly subject to the all-encompassing influence of financialisation, it is confronted with problems that require new perspectives from studies in complex systems. The recent global financial crisis revealed that some of the world’s brightest economists were unable to foresee the failure of the financial market they grew to admire, which became so complex that even they couldn’t understand it. What was needed at the time and at present are studies in complex systems that can help us understand the vulnerabilities of the UK financial sector, and the global financial market. Complexity science examines the underlying nature of how systems evolve over time. ‘If the whole matters more than the parts’, as Aristotle once declared long ago, then examining the financial system using approaches from complexity science may help financial regulators and society come to grips with the ‘unknown unknowns’ of finance. 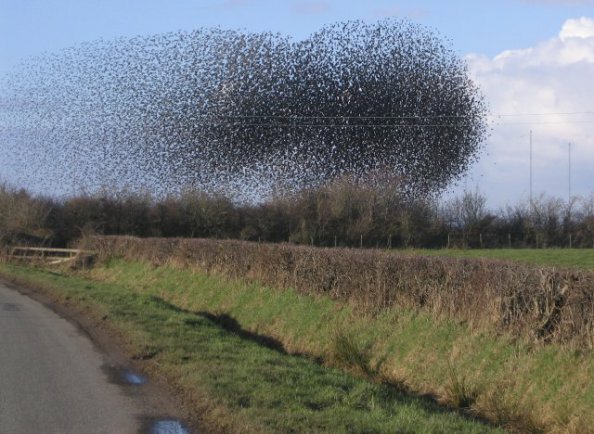 How starlings flock or swarm together in flight is an example of emergence. Ideas from complexity science useful to understanding finance include emergence. Emergence refers to something that was created from the interactions between the constituent parts of a system or multiple systems. The UK financial sector consists of interlinked banks and other financial companies. From their behaviours and interactions with each other and other systems, such as the economy, emerges the financial system. This makes the financial system similar to examples of ecosystems, such as plant or animal communities, which are also complex, interdependent and vulnerable to systemic failure. If a financial system is complex how do you define or attribute the causes of events that lead to a crisis? The globalised banking system has radically changed finance which has led to new challenges in financial regulation. Questions from a complexity science perspective on the financial sector include (1) how do you govern a system that is too complex to understand? and (2) how can you ensure that your regulations will have the intended effect? One potential solution is to simply make the financial system less complex. Give it a set of simple rules and its actions should be more or less predictable, but actually it doesn’t matter how simple the rules are, a system can still behave in a complex way. A good example of this comes from a computer simulation known as ‘Conway’s game of life’ that while is governed by a simple set of rules, will still have emergent properties that are difficult to predict. Each cell with one or no neighbours dies, as if by loneliness. Each cell with four or more neighbours dies, as if by overpopulation. Guided by these simple rules, complex movements and patterns emerge from the interactions between different cells. Finance is complex mainly because it operates through networks of banks. There are numerous interactions that take place across these bank networks in the UK financial sector. The changes in one part of the network by regulators could produce unwanted emergent effects in another. This is because it’s incredibly difficult to predict how interventions into a system will evolve over time. In the UK, while it could be argued that complexity helped make London a global financial centre, namely through globalisation and relaxing controls on competition, it has brought with it risks that were mostly unknown prior to the 2007-08 banking crisis. The crisis revealed how a complex banking system is in some ways more vulnerable to collapse because of the levels of connectivity between banks. The more interconnected a bank is the more likely it could be exposed to systemic failure. If its failure is not prevented it potentially brings down other banks with it and severely hampers the financial economy. This was the case with Lehman Brothers in the US, which was in turn connected to the failure of Northern Rock in the UK through sub-prime mortgage lending. The crisis also revealed that it is even more difficult to identify the causes of failure because in a complex system what causes it to fail has no immediately apparent causal link. It is only after the event that people are able to justify what happened. 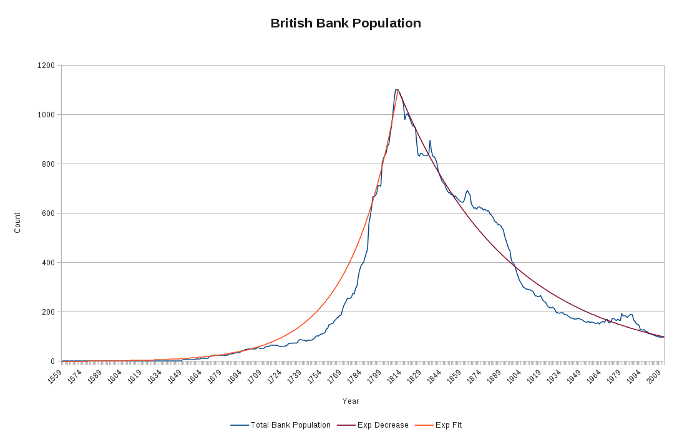 The rise and fall of the British bank population. In the 19th century banking changed drastically in a short period of time. In 1826 the implementation of joint stock banking made merging easy to do because it lifted the restrictions placed on the size of banks. Over a 15 year period (1888-1902) 29 per cent of the total banks in Britain disappeared, and the remaining banks became much bigger as a result. 270 bank mergers took place between 1870 and 1921 alone. Large banks ate up smaller banks, which made bank cartels a historic reality by the 1920s, one that has continued to this day. Mergers caught on quickly with other banks who copied their behaviour. In some cases banks may have been forced to copy their competitors to look like they were competing. To buck the merger trend could have been damaging for a bank. They had to copy in order to survive by merging together. It was either grow with the herd or die. Banks had created a positive feedback loop. The creation of banks promoted the creation of even more banks. A positive feedback is self-reinforcing; it creates more of the behaviour that started it. Eventually bank mergers had to be brought to a halt because government feared that the population of banks would drop too low. Legislation influences the environment of banks and in turn affects their behaviour. Joint stock banking in 1826 allowed unrestricted mergers so banks could grow as big as they like. It also made bankers no longer liable if their bank failed. For banks in Britain, consolidation and the end of liabilities were evolutionary responses to a changing financial environment. Not only were banks allowed to increase enormously in size, but they could engage in kinds of risk taking behaviour that were unheard of in the past. However, eventually partnerships and limited liability, which made partners liable if their bank failed, had to be done away with at some point. If they had not there would have likely been thousands of banks in place, making the system completely unworkable. The UK financial system had to evolve in response to government interventions that changed the rules. But how do legislators know how banks would evolve in response to their interventions? The answer is ‘they don’t’, not exactly, as in the case of the 2007-08 banking crisis, banks can behave in rather unpredictable ways, and before government regulation catches on to what they’re up to, it’s too late. While legislative intervention influences the financial environment, what banks do in response changes the nature of the financial system, pushing it into a new state entirely. 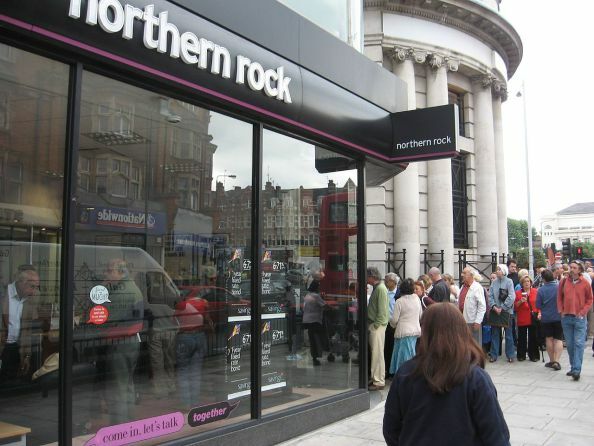 A casualty of the financial crisis in the UK was Northern Rock. The run on Northern Rock bank branches in 2007 is an example of a positive feedback. When Northern Rock became insolvent, meaning it could no longer meet its liabilities, news of this spread rapidly and erupted into a public panic. People began queuing outside of the bank to withdraw their money inciting more people to do the same creating another positive feedback. However, Northern Rock was merely a symptom of systemic instability in the UK financial sector. This means the UK financial system was already unstable before Northern Rock went bust. Financial history has some important lessons for how the UK banking system has responded to its changing financial environment over time. But history alone is not enough for understanding what the financial system may be in store for in the future. The UK financial sector today is even more complex than in the past. Globalisation continues to make it vastly more interconnected and complicated. If a highly connected bank in one part of the world fails it could cause others to go down with it, regardless of what country they are in. Finance is a global enterprise and it is likely to stay that way, especially as other financial sectors beyond North America and Europe become more well-established. Similar to coming to grips with other complex global crises such as climate change, complex modelling approaches can help us better understand financial crises, not by simply modelling the potential risks the financial system is exposed to but also bank networks. If you built a model of the financial sector it could run constantly to look for rare events or signs of systemic failure. Take real time information gathered from financial monitoring, plug it into the model and see what you get. Any information from banks could potentially be fed into a series of slightly different models that could be run simultaneously. While no model would be a perfect replica of the financial system, modelling could reveal so-called ‘black swan events’ that otherwise would go unnoticed. However, even if you were able to predict the next financial crisis, there is still the problem of adapting to it, something that regulators tend to do on an ad-hoc basis. When the financial system crashes government implements policies that patch the holes that started the crisis, but what they don’t do is look for where new holes could open up. How can you adapt to something that you’ve never experienced before? Imagine a financial system that is complex-adaptive: self-regulating and aware of what is happening. If banks were aware of the complex interconnections they share with other banks or financial companies it could lead to a more stable system, potentially discouraging the kinds of overly risky behaviours that underpinned the last banking crisis. If a system was more self-regulatory it would need to be responsible for its own stability, and regulators would have to continuously monitor and reflect upon the behaviours of banks to respond more quickly. Simulating bank networks could help test assumptions about the behaviours governing the financial system. This would require real data to determine the accuracy of the simulation but once calibrated could say something about how banks may behave in the future, or address external influences on the financial system, as was the case with merger legislation. However, a model is still only as good as the data that are available. A complex-adaptive financial system would potentially be a more transparent structure than what is in place today that recognises how the success of banks is linked to their competitors, and if they were wiped out they would fail also. It is already the case that decisions within the UK financial sector tend to be far more effective in influencing the financial system than external government regulation alone. For legislation to be effective it needs to investigate the potential consequences of certain policies by examining the long-term evolution of the financial system, which can be accomplished through modelling and simulation. Where data is incomplete in financial history complex modelling and simulation can be used to refine historical understanding and provide similar insights. Models that enhance understanding of the past, and how we arrived at the present, can be run to make forecasts of possible futures, but to achieve this involves first answering what kind of financial system is desirable for the future? In a complex system the decisions we make now could have important impacts on the future of finance that need to be given attention today. This entry was posted in Complexity, Finance, Modelling. Bookmark the permalink.